There is a strong instinct in me, which I cannot analyse, to draw and describe things I love - not for reputation, nor for the good of others....but a sort of instinct like that of eating or drinking. I was brought up on a farm which had most domesticated animals (and access to wild ones) and they were my first loves. I modelled them and people liked them so I drifted into selling at agricultural shows and made many trophies of the champions. which produces bronzes of a very high standard and equally remarkable low prices. I need to order 6 to make this viable. 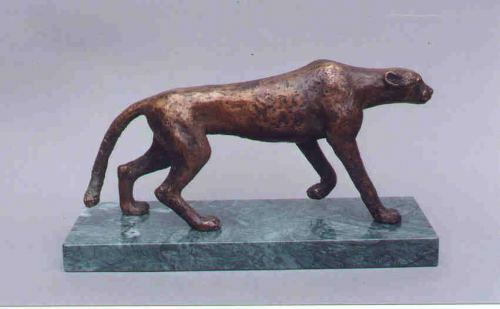 I have done this recently with a Wensleydale Sheep owner who found five others who wanted this rare model and now the proud owners now each have a fine bronze for a very modest price. Click on the titles below to see other cattle sculptures. Bull's Head - see under "Outdoor and Wall"
This was based on a champion It is the only one left, but more could be produced if at least 6 are ordered to make it viable. I specialised in goats many years ago and have another champion goat, a goat looking over a gate, a "scrub" goat and others. These are only of interest to goat owners! If you are such a person, contact me on the Contact page.